The sun is out. The flowers are blooming. Spring is in the air. Check out LiveWell’s Power Salad and make a meal to match your mood! This salad is packed with protein and fresh fruits and vegetables and, if you’re into Instagramming your lunch, looks beautiful on the plate. This spring, challenge yourself to “power up” one meal a day; replace your go-to convenience food with something packed with nutrients and see if you don’t have a new spring in your step. Small lifestyle changes, such as increasing servings of fruits and vegetables, reducing fat and calories, and increasing physical activity to 150 minutes a week can lead to modest weight loss—which can prevent chronic diseases. For instance, people with prediabetes can reduce their chances of developing type 2 diabetes 58 percent by making these changes. Need a little support? Check out preventdiabeteskc.com for a listing of Diabetes Prevention Programs near you. And get going on that Power Salad, a delicious and nutritious way to power up! 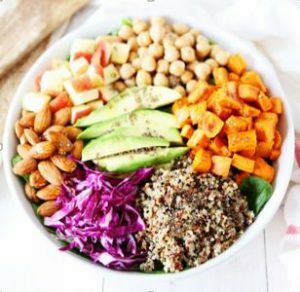 In a large bowl, combine spinach, roasted sweet potatoes, quinoa, chickpeas, almonds, apples, red cabbage, and avocado. For the dressing, combine olive oil, lemon juice, balsamic vinegar, honey or agave, and chia seeds in a small bowl or jar. Whisk until well combined. Season with salt and black pepper, to taste. Drizzle the dressing on the salad and toss well to coat. Serve! Note: to roast the sweet potatoes, preheat oven to 400 degrees F. Place chopped sweet potatoes on a large baking sheet, drizzle with one tablespoon of olive oil and season with salt and black pepper. Roast until tender, about 30 minutes, stirring occasionally. This salad is very adaptable! Feel free to add your favorite veggies and fruits to the mix!